When the trees start to fall next month at the Ellerslie Short Rotation Woody Crop Technical Development Site in Edmonton, Alta., will anyone in the pulp and paper sector or government care? Short rotation woody crops (SRWC) are genetically-identical, but not genetically-modified, hybrid poplar, aspen, and willow clones grown on plantations like a grain crop. They could significantly benefit the pulp and paper sector because they grow much faster than trees in the natural forest. They could also help governments achieve their greenhouse gas (GHG) reduction targets much faster because trees are the planet’s natural carbon sinks. Yet, only a few Canadian pulp and paper producers have dabbled in this developed technology to enhance their fibre resources, despite countries and competitors like Brazil, New Zealand, and Sweden having well-developed and advanced plantation assets. And governments have only shown tepid interest in what SRWCs offer as a GHG mitigation tool through programs like the federal government’s ill-conceived Forest 2020 plantation program launched during the Chretien administration. The Ellerslie SRWC site is operated by Natural Resource Canada’s Canadian Wood Fibre Centre (CWFC) and was the first of many demonstration sites established across Canada over the past 16 years. Derek Sidders, CWFC program manager, technology, development and transfer at the Ellerslie SRWC site. Established in 2002, the 18-hectare Ellerslie site has achieved fibre volumes of 250-400 cubic metres per hectare over a very short time period of only 12-16 years, as well as six-to-10 oven dried tonnes per hectare per year of hybrid poplar and willow species using the concentrated biomass design. The Canadian industry’s and government’s lack of interest in this technology may soon come to haunt them if climate change trends continue. 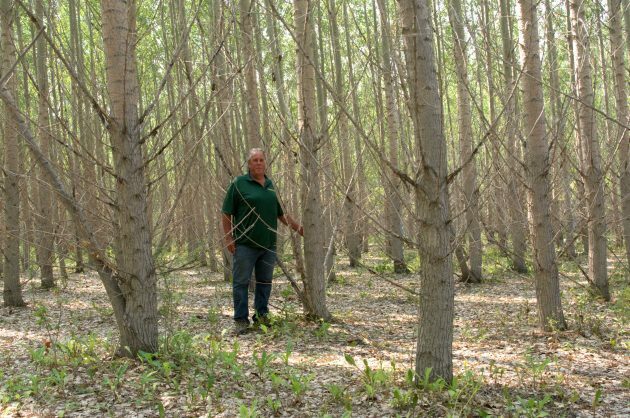 All of North America is experiencing a massive natural poplar and aspen dieback, which is an important feedstock for the pulp and paper sector. Scientists believe that escalating temperatures are to blame. That’s why the pulp and paper sector and governments should care about an upcoming series of workshops being hosted by the CWFC in Edmonton that will demonstrate how to establish SRWC plantations, how to harvest the trees, options for on-site processing, and the most cost-effective ways to transport this wood fibre to end users. The Ellerslie SRWC Technical Development Site houses various examples of three afforestation designs developed by CWFC over the past two decades. Afforestation is planting trees on land that isn’t already forested. The CWFC designs are high-yield afforestation, mixed wood afforestation, and concentrated biomass afforestation. The first two designs produce trees suitable for wood pulp within about 15 years, while concentrated biomass afforestation produces shrubs within three to five years that can be harvested primarily for use in the production of bio-energy. As the Ellerslie crop harvesting program unfolds over the next few months, it will show potential commercial users of CWFC’s various plantation designs how this afforestation approach can be integrated into current fibre baskets and forest management systems. It will also show how to maximize production from the land base through the implementation of such innovative designs as CWFC’s mixed-wood afforestation pattern, which produces both a hardwood and softwood crop on the same site. Various technologies will be used and evaluated as part of the harvesting demonstration, producing wood fibre in different formats ready for transport anywhere from logs, to round bales, to chips ranging anywhere from over five centimetres to under four millimetres thick, with the goal of then evaluating the amount of wood fibre that can be loaded and transported in a single truck load, depending on its physical form. Researchers want to test and verify the cost of transporting this raw material in a variety of formats to end users. Without a doubt, the Ellerslie site has demonstrated the commercial potential of SRWC crops based on CWFC’s designs and management protocols, and samples from this site represent the nest eggs and nucleus of the development of the next generation of demonstration sites. This harvest will also provide an invaluable research opportunity to gather data as to the true value of these crops for carbon sequestration as part of Canada’s carbon mitigation and adaptation strategy. Sidders says that any person, organization or stakeholder group can contact CWFC for a private/custom tour of the site and its rich wealth of knowledge, but time is of the essence as the harvesting program will start in mid-November. Once it is harvested, this demonstration site will be gone, although there are several others across Canada still available for tours. He can be reached at derek.sidders@canada.ca.